Do you want to edit CSS of your themes without writing any code? 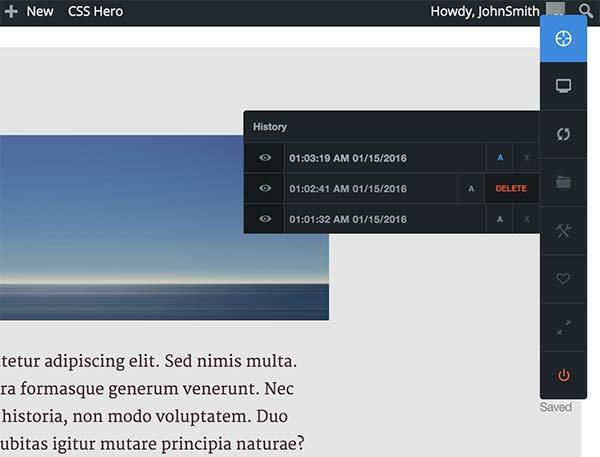 CSS Hero is a premium WordPress plugin that allows you to edit CSS of any WordPress theme directly from the front-end using a live preview. In this CSS Hero review, we will take a look at its features, performance, and ease of use. What is CSS Hero and What it Does? 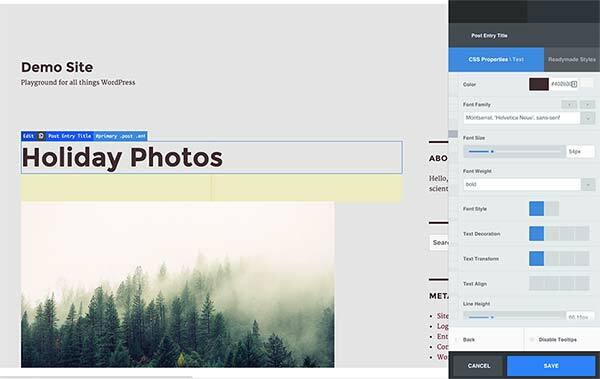 CSS Hero is a powerful visual CSS editor for WordPress powered websites. It allows you to customize the appearance of your WordPress site using a live preview mode with easy graphical user interface. No coding or any knowledge of CSS or HTML is required. The majority of WordPress users are not web developers. These users don’t know much CSS/HTML to edit or customize their site’s appearance. If there is no option to change something in their theme, no matter how small or easy it is, they are stuck with it. CSS Hero claims that any WordPress user can customize visual appearance of their websites without writing code. Having said that, let’s take a look at CSS Hero. The first and the most noticeable thing about CSS Hero is its ease of use. After installing and activating the plugin, simply visit the front-end of your website. You will notice a CSS Hero button on the front end of your website. Clicking on it will expand CSS Hero interface and you can start customizing your theme with live preview visible at all times. The visual editor in CSS Hero is very easy to use. Simply click on the pointer and then click on any element on your website. CSS Hero will load its CSS classes and you can start customizing it. All element properties that you can customize are displayed as buttons. Like text, background, border, size, margin, padding, etc. Simply click on a property, and CSS hero will show you what you can do with it. There are buttons, sliders, and easy controls to increase or decrease sizes, values, and almost everything you can do with CSS. When customizing a website, you may try something and not like it. You may try a couple of things first and then decide to go back to the first change you made. CSS Hero allows you to easily go back to any changes you made and undo them. You can also browse between different states to see which one you like better and then activate it. This feature is a great help for beginners who just want to try different things. If something doesn’t work out the way you expected, you always have the option to revert back. CSS Hero allows you to easily preview your website on different devices and screen sizes. You can also edit and customize how your site looks on the mobile using the same user interface. Testing and previewing a website on different devices is difficult for beginners. Not to mention making changes to their mobile responsive WordPress themes. CSS Hero makes it possible to preview and edit the mobile appearance of your site. 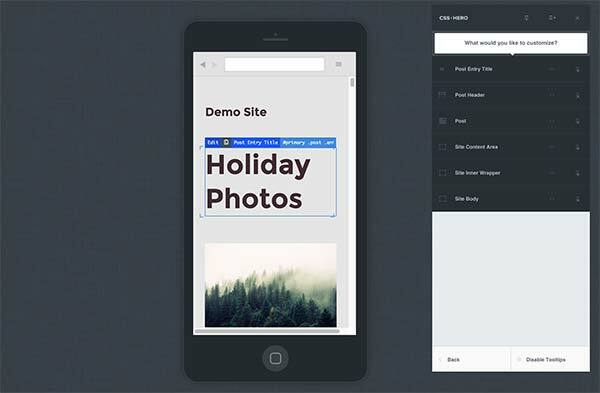 You get all the same features and ease of use when editing your site’s mobile appearance. 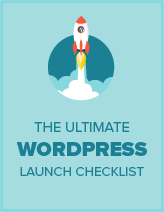 There are thousands of WordPress plugins and themes available for WordPress. Some of these themes and plugins may not be following the standard best practices for WordPress development. CSS Hero comes prepared for themes not compatible or tested with CSS Hero. It will automatically suggest you to turn on the Rocket mode. 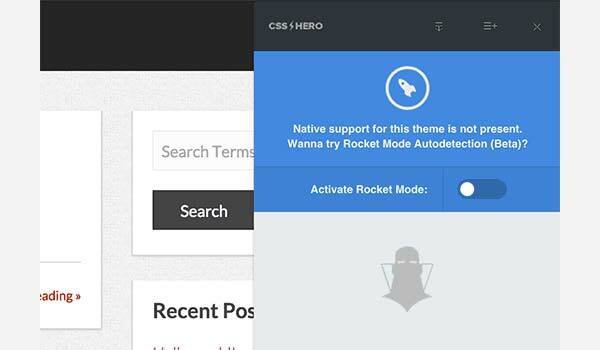 In this mode CSS Hero automatically detects different elements and it works brilliantly for most themes. Apart from the important features that we have mentioned above, CSS Hero comes with a lot more. CSS Hero is a paid plugin with three levels of pricing plan. Their starter plan comes at $29 per year and is valid for a single site. The premium plan is priced at $59 per year and you can use it on 5 sites. Their best plan is the pro which comes at $199 per year and you can use it on 999 sites. It also comes with an addon plugin called Hero Inspector. All plans include one year premium support and updates. Support is provided using a ticket based system. CSS Hero also comes with extensive documentation, which is particularly helpful for users who like to solve problems on their own. We were truly impressed by how easy to use CSS Hero is. It has a nice simple clutter free interface which is very intuitive. The out of box experience is excellent, it works as promised. Pricing options are very reasonable and the documentation is quite extensive and well written. We give CSS Hero 5 out of 5 stars. Here is the breakdown of our review score.